This notion that the Dodgers need to Watch out! because Yasiel Puig’s mental blunders could cost them a playoff game is the latest in a series of stories about the rookie phenom that mean well but miss the point. If Los Angeles is lucky enough to be in position to watch Puig make a costly mistake in a playoff game, whom do you think everyone in the city will need to line up and thank? The Dodgers don’t need to watch out for Puig’s mistakes any more than they need to watch out for Mark Ellis’ inconsistent bat, Carl Crawford’s throwing arm, Don Mattingly’s bullpen choices or any of the numerous weaknesses that every member of the team has. 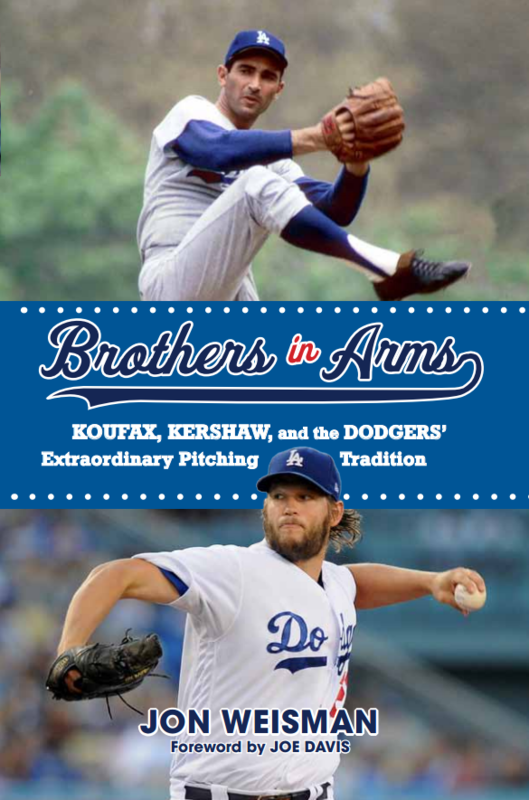 Admittedly, it’s hard to find them in Clayton Kershaw, but even him. Yasiel Puig makes mistakes in the field. His mistakes can be interpreted as character flaws, which can be infuriating. Just because he makes a certain type of mistake doesn’t mean he is singularly capable of hurting the Dodgers in a way no other player is. With every player, you evaluate the pros and cons in a total package, and then you put out the best possible lineup on a given day. Evaluating Puig’s weaknesses in a vacuum, independent of the immensely promising strengths, is a pointless exercise. The tricky thing with Puig, one can concede, is that it’s not like he only makes mistakes against lefthanders or in day games. So you can’t hide them the way you might, say, hide Andre Ethier’s production against lefties (Sunday’s homer notwithstanding). Until there are three other outfielders whose net production is better than Puig’s, you play Puig. And right now, no such outfielder on the Dodgers exists, unless Matt Kemp returns from the disabled list in his 2011 form. Let alone three of them. Kemp, of course, illustrates the folly of getting caught up in a player’s mental mistakes. Before he became a Most Valuable Player candidate, people became obsessed with his baserunning errors, to the point of calling for him to be traded, when his talent was obvious and all that was needed was more patience for him to get the message. It wasn’t the benching of Kemp that solved his issues. It was, all parties subsequently disclosed, a lengthy and frank conversation between Kemp and Ned Colletti that got everyone on the same page. Kemp reached a level of maturity that Puig will probably get to at some point, through patience and tutelage and conversation and several other tools. In other words, it might not arrive by by 4:05 p.m. today. It will come when it comes. It will come as fast as the Dodgers can make it come. It will come soon enough. This is not to say Puig shouldn’t get an occasional day off, like every other Dodger has gotten since Steve Garvey played first base. But a punitive benching isn’t likely to do much other than make the people watching the games feel superior. Mistakes like throwing to the wrong base are easy pickins’ for mortals like fans and sportswriters, because it’s the kind of thing we mortals could actually get right. If I know to hit the cutoff man, Puig must be a human disaster area if he doesn’t, right? At the end of the day, wouldn’t you rather have a ballplayer whose biggest problem is he throws or runs to the wrong base, rather than one whose biggest problem is he can’t hit or run at all? Puig is already learning patience at the plate faster than anyone way, way back in June dreamed he would. If Puig’s biggest remaining problem is learning to hit the cutoff man, that’s not something to denigrate, that’s something to celebrate. And we’re not even discussing the the fact that the same approach that sometimes leads Puig astray might also lead him to triumph, many times over. It’s entirely possible that a Puig mistake will cost the Dodgers a game. That makes him like nobody else — except everyone else that wears a Dodger uniform. Dodgers at Marlins, 4:10 p.m. Please can we go back to examining the mental state of Chad Billingsley? Next season – have to be patient on that one. What are your views on Hee-Seop Choi’s defense? Thank you for saying what needed to be said. He is young, he is learning, he makes far more winning plays than mistakes. He will mature with experience. But let Puig be Puig. Thank you!! This is great. Please tell this to Tony Jackson, because he won’t stop talking about how much damage Puig is going to do with his mental errors. No, Puig needs to LEARN! Just like Matt Kemp did, because hardened old-timers yelling at a supremely talented young athlete with immense raw talent who is just now learning to play a game amongst players that are as talented (or at least, as close as anyone will come) as him always works. Puig makes mistakes of aggression, to be sure. But on almost all of those plays, they would be good (either getting an out with a throw or advancing an extra base) if not for the fact that the player on the other side of the ball made a big league play. Hamels legitimately picked him off–but that’s because Hamels is an elite pitcher with a great move. How many players has Puig ever faced with a move that good. Utley beat his throw to third base (and, but a couple of hairs), and Brown made the heads-up move to advance to second. But those took good big league plays that, if the other side does not execute perfectly, work out for Puig. The only problem for Puig is that he is finally playing at a level where other players are capable of making those plays. Seriously–how many players in Cuba or AA have the combination of smarts and base-running skills as Chase Utley and Dominic Brown??? How many AA Center Fielders would have actually thrown him out on third when he tagged on the shallow fly ball (a play that was still pretty close? For that matter, how many major leaguers could do those things? Ted Lilly could never have picked off Puig, Juan Pierre could never have thrown him out from Center Field, and Puig would have easily nailed several #3 hitters in the NL West (Pablo Sandoval and Adrian Gonzalez, for certain). He does need to learn, and the manager and coaches do need make sure he gets the message. But there are a lot of ways that he is only going to learn by making those mistakes and seeing what the competition can do. Ironically, all the complaints about Puig do seem to be the mirror image of complaints that Larry Bowa had about Matt Kemp. The good news is that Mattingly never seemed to buy into it with the Bison, and eventually, he became the best player in the league with Mattingly as his manager. Hopefully, he does the same with the Wild Stallion. Well said Jon. This appears to be in response to the glass-half-empty piece by Jon Morosi. While I’ve seen some comments by the coaches that express some level of frustration, no one has yet used the term uncoachable. The Dodgers’ coaching staff, if not the whole organization, would have little tolerance of an uncoachable player of any talent level. While we’re at it, let’s bench Hanley Ramirez for making two errors in the ninth inning and play Nick Punto instead, because Punto has hit as many homers as Hanley in the past week, and offers gold-glove defense that you just can’t teach! At the risk of a rule 5 violation, what do Kemp, Hanley, and Puig all have in common that makes them the target of these kinds of aspersions on their character? Can’t they just encourage Puig to use the “Think” method when running bases or throwing out runners? It worked for Ron Howard. Wouldn’t Puig’s huge talent, but erratic play make for a great ESPN Sportscenter commercial? I’m surprised that their writers haven’t put anything together yet. Thanks Jon… I hadn’t seen that cool promo…. All this talk of Puig as “wild stallion/young buck” from pro writers and broadcasters has made me pretty uncomfortable this summer, to be honest. And as your next to last paragraph states, and facts/stats prove, whatever mistakes he’s made have been overridden time and again by the things he’s done well. the amazing things even. Like throwing runners out at third with his gun. In some ways, he’s challenging current convention and we all know how that upsets sportswriters. He takes it to almost a Little League level and challenges other players to be able to execute. If they do, they win, if not, he takes advantage of complacency. The play I always think of in this regard was in Colorado when he scored from second on ground out to the first baseman. Wilson activated, Van Slyke gets frequent flyer miles, mustache wax, and more practice spelling Albuquerque. Poor Scotty sure has racked up the frequent flier miles this season. Guess we’ll see him again on 9/1. Wasn’t it John Wooden who said “turnovers are good, because they are errors of commission rather than omission”. Obviously, it’s apples and oranges, but you would rather have a young, supremely talented player TRYING to make plays, TRYING to use every tool in his bag. The great plays he has made are a direct result of this approach…and for awhile the bitter will come with the sweet. The thing I love about him is that he comes to the ballpark every day absolutely and resolutely determined to make an impact with each aspect of his considerable ability. He will be fine. FYI – for the local L.A. area fans who are complaining about no KCAL due to cable, I have roof-mounted $15.00 amplified antenna run through a coax line to our t.v. Haven’t had cable in two years and listen to non KCAL games on the transistor. Puig did push the learning thing when he tagged up on a fly to short center even if it was a close play due to the throw being a little wide. Vin Scully is not as excited with Puig as he was with Willie Davis. Maybe a little been there already seen that. Davis seemed to be safe more often than Puig though. Davis on several occasions would score from second on a play at first. Scully loved that. That’s the comparison that always comes to my mind. Since Pederson was voted most exciting player in his AA league it must have been entertaining with both Puig and Pederson playing together. Hopefully Pederson will get it going again. Which I didn’t get to see live (and in fact I’ve never seen it on tape) because it was a day game when I had to work. Probably for the best. I remember being at work and hearing it happen on the radio and having it turn my stomach. I remember not having high expectations that year, and thinking after that, it just wasn’t gonna happen for them that year. Puig is a massive talent whose tools, so far, may be greater than his judgment. Over time, you can learn judgment, but you can never acquire physical tools that are largely (but not exclusively) genetic. 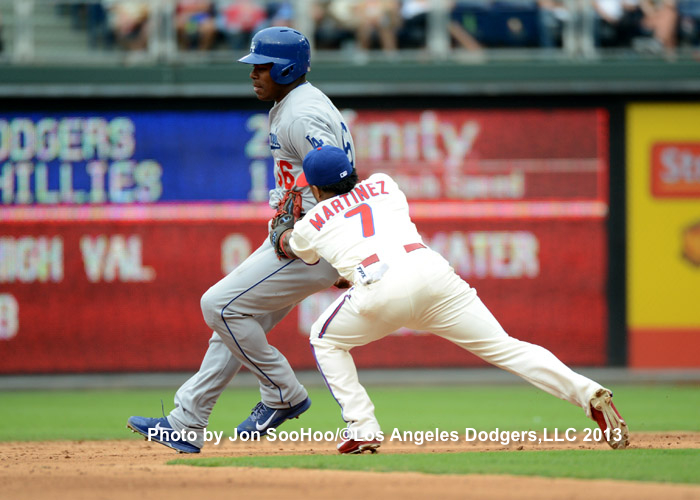 Baseball is a complex game for someone as young and inexperienced as Puig. How many new players have we seen get completely overwhelmed by the rigors of baseball at the highest level. If I was Mattingly, I’d tell Puig to concentrate on continuing to improve his approach at the plate, and everything else we’ll live with (for now). Your ‘ugh’ had me worried. The DP fixed it! Reaction to walking a fellow in front of Stanton. Heck of a play Crawfish! And the sound of at least 20-30 people in Miami applauding it mildly! Two web gems in a row! Even Hanley made an ok throw! Dodgers still rank up there in terms of total errors, but middle of the pack for defensive efficiency and lead in DPs. These kids on the Marlins not intimidated. Crawford looked like he might have had time to catch that ball. He was backing up slowly instead of running – ball ended up bouncing on the warning track. He was never gonna catch that. Certainly not the way he played it, agreed. Should have never gone home there. Okay, boys. Get ’em back. Obviously this Fernandez kid can pitch a little. Silver lining! Take some pitches in the 6th and get him out of there. Doesn’t seem to normally go much over 100. What would the panic level be if the Dodgers lost two straight games for the first time in two months? On a scale of 1 (1955 pennant race) to 10 (1951 pennant race)? D-backs down 5-1, bottom of the fifth. Wish I could see this kid – he sounds amazing. I loves me some Uribear! Plus, running up the pitch count. Uribear loves him some Jose Fernandez. Tie game and on to the bullpen, not a bad inning! Let’s go Ry-U clap clap, clap clap clap. Come on Ryu, settle down. Why isn’t Mattingly taking Ryu out? His pitch speed down. He seems tired. He’s gotta learn how to forget about his last at bat. Seems to happen fairly often where if he seems upset he just goes up hacking and chasing. He might need a day off to sit in the dugout calm down. Seven strong innings from Mr. Ryu. I’m not (necessarily) superstitious, but it’s worked before. . . . I’m taking my dog to the park — let’s get some runs!!!!! Don’t forget the baggie and scoop! Hey! What do you mean by Scoop? Actually, I am about to go play catch with my dog in the yard, although he never tosses the ball back. Scoop is a nickname from when I was a newspaper reporter. I didn’t read Claire Bee’s books while I was growing up, but I read a lot of Duane Decker’s baseball books about his mythical Blue Sox team, including “Good Field, No Hit” and “The Catcher from Double-A.” Enjoyed them tremendously. Looking those up (nice discussion here) it appears I read at least some of those. John R. Tunis wrote a goodly number too (search his name in the search box on the left of that page) for titles. I wonder how findable those are. The Hilton books are available on E-bay. Addendum: Surprisingly, my state library has 3 of the Decker books. Think I’ll borrow them for old time’s sake. I was just talking about the Tunis books as well today! “The Kid From Tompkinsville,” World Series,” and “The Kids comes Back” in particular . . . how can you not like a book with a Dodger as the hero . . . and a WWII hero as well in the latter! Yeah, I remember those better than the Decker ones. Zane Grey even wrote a few baseball juveniles before he made his fortune writing his Western novels, if I remember rightly. I was just talking about that series today to the librarian at one of the schools where I work! BTW, I DID bring the bags. But this park outing didn’t help the Blue batters . . . nor the bullpen! Two losses in a row is unacceptable! Why on earth would you let Ryu pitch to one guy in the 8th and then take him out? Why not just let Withrow start the inning? Sometimes I don’t understand Donnie Baseball’s thinking. It’s not surprising that Dodgers would lose this game – Fernandez is filthy. This isn’t like our pen. Definitely feels like prime (bad) early ’13 — wasted opportunities at the plate (tho they did score 1 with the bases loaded) and imploding bullpen. Jon called it. Let;s credit the opposition pitchers and hope a new winning streak begins tomorrow. So the veteran first baseman lost track of the outs. That could hurt the team in the playoffs. Tsk. Sarcasm doesn’t become you, Bob. A little too Rule 7ish? Nope, not for me. I lean that way myself. Just an instance of youthful enthusiasm. Silver Lining” At least it sounded like a better at-bat than his others. Second Silver Lining: The Dodgers don’t lose ground to the D-Backs . . . scratch another day off the calendar. . . . Let the winning streak start manana. Ho-hum – 7 1/2 game lead. I wouldn’t bench Puig for his style of play, but I’d consider giving him that occasional day off tomorrow because he is in a mini-slump. Magic number of 32 to clinch the division. Remember the BoSox — this weekend but especially the Collapse of ’11. That, you may recall, was the year of the Bucky Effing Dent game and the Bob Welch – Reggie Jackson strikeout confrontation. It appears the Dodgers will likely face the NL Central winner in the 1st round of the playoffs. Cincinnati (38-20) and Pittsburgh (42-22) have great home records, and the Cardinals have the best run differential by far, so it’d be nice to finish ahead of the NL Central winner and get HFA during the 1st round. Dodgers end the year with a 10 game road trip and the 3 final games at home. It’d be nice to not have to go right back out on the road when the season ends. Plus, I have confidence that Donnie will use Kenley Jansen when he’s at home. I’m sure fans of Atlanta and Boston were doing similar speculation at this point in ’11. Luckily, the answer to this AND “first things first, win the division” is the same: just keep winning! And just like that, Dodgers have lost their grit, except for the gritty bench players. At least according to dodger talk. Been busy so I hope I’m not repeating the following- Stephen Fife walked 4 consecutive hitters with the bases loaded in a 6 run bottom of the first after BB, fly out, HBP, single. He was then replaced. He threw 34 pitches, 8 for strikes. Yes, not something to repeat. Wonder if Howell was looking over his shoulder at Wilson tonight – not that he should have been because he’s a situational lefty, but how about Withrow? At least Withrow recorded an out. Not a fan of Wilson and his antics, hope he doesn’t mess with the bullpen Mojo. Thank you for writing this piece. People are unbelievable sometimes. Rather than critique Puig’s every mistake as though he hasn’t had the single most electrifying and awe-inspiring rookie season any of us have ever seen from a Dodger (including Fernando), we should enjoy the rare experience of seeing a young player’s growth before our very eyes as he simultaneously does incredible things on a near-daily basis. At the end of the day, we are just spectators. We aren’t a part of the organization, we aren’t coaches, and we certainly aren’t players. People should get over themselves. Fernando-mania was pretty awesome — and a full season. Panic much? Bad Capuano could put us at three losses. From now on I am only counting series. Offense needs to contribute. They’ve overcome Bad Cappy several times. Yep, the last three bad Cappies were overcome. So I read the article about Colletti saying he had a talk with Kemp at the end of the 2010 season. What I got from it was that Colletti believed the 2010 Dodgers only played 10 days of championship level baseball, but for some reason he still traded James McDonald and Andrew Lambo for Dotel. That makes that trade look even worse in my opinion.